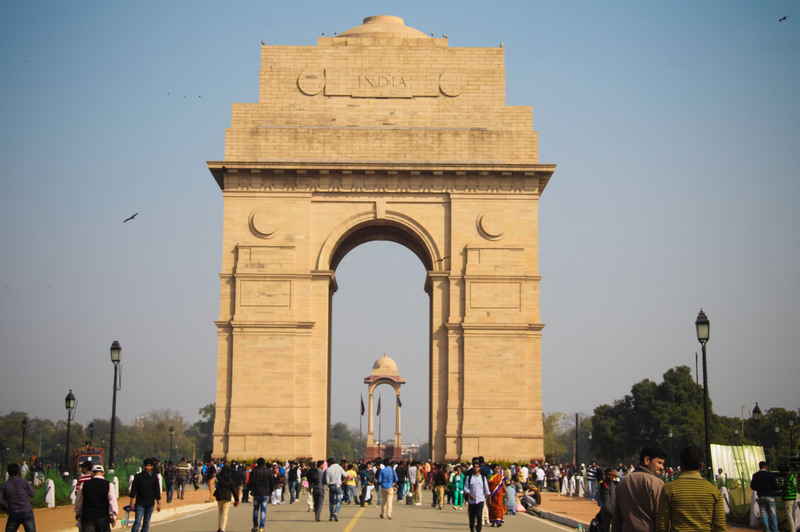 Then we arrived at India’s iconic landmark: India Gate. 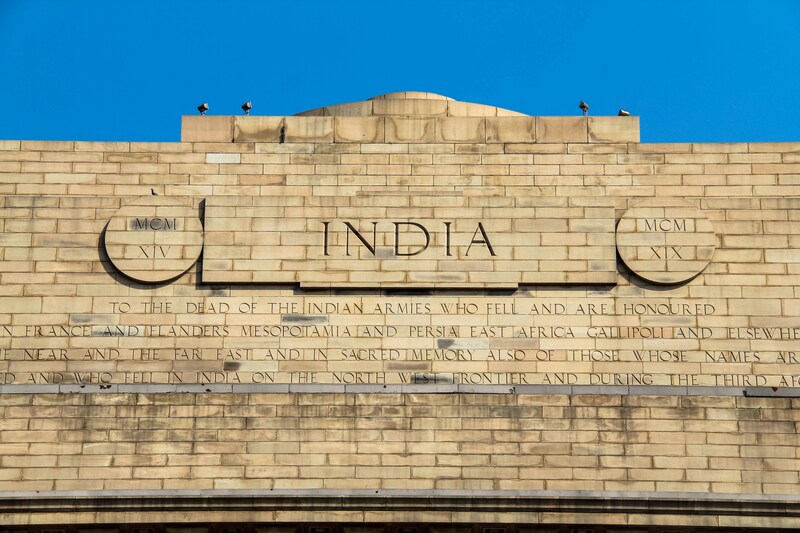 It was completed in 1933 to commemorate the 70,000 Indian soldiers that lost their lives fighting in the British forces during World War II. 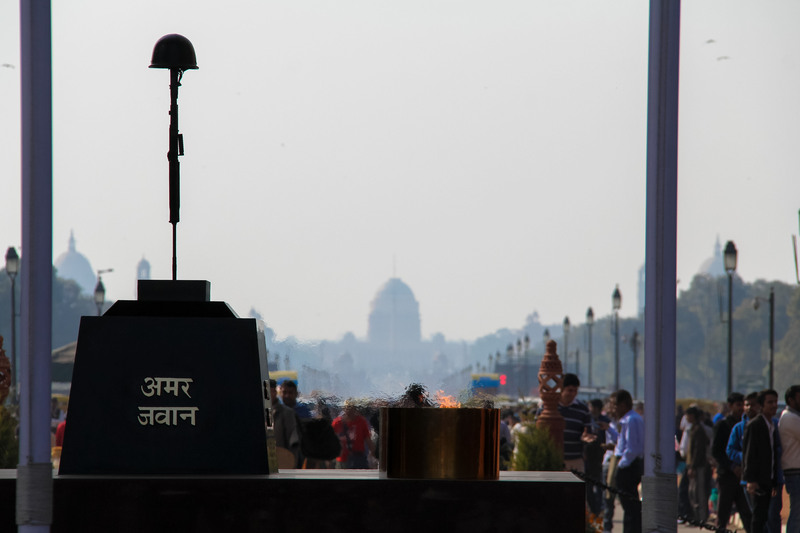 Rashtrapati Bhavan – or the Presidential Residence – is across the street from India Gate. Had it been a clearer day – which is a rarity in New Delhi at this time of the year – we would have gotten a better view of that building as well. I had expected this would happen but wasn’t prepared for how hilarious it was when locals started asking if they could take photos with Cat. I was the designated photographer as people were wowed by Cat’s blonde hair and green eyes. This guy was my favourite though. I decided to take a photo of my own. 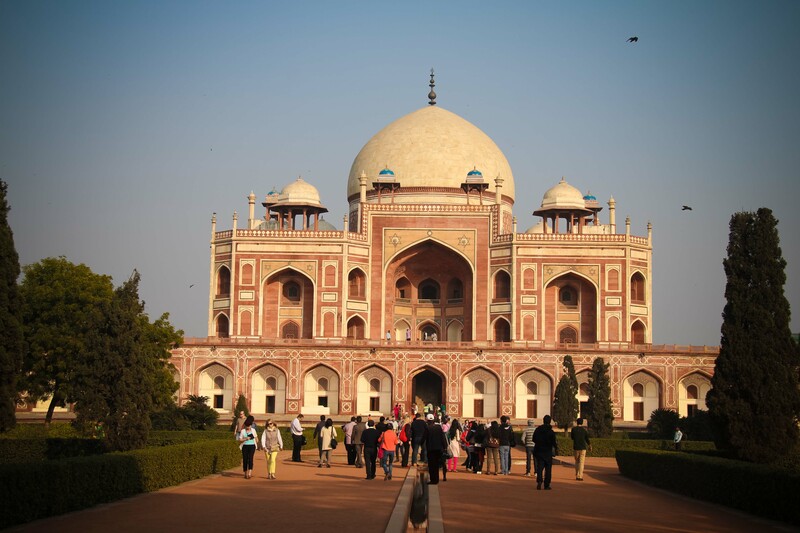 Then we made our way to Humayun’s Tomb. Humyaun was the second emperor of the Mughal dynasty that spanned over 300 years. His first wife, Bega Begum, commissioned this tomb. 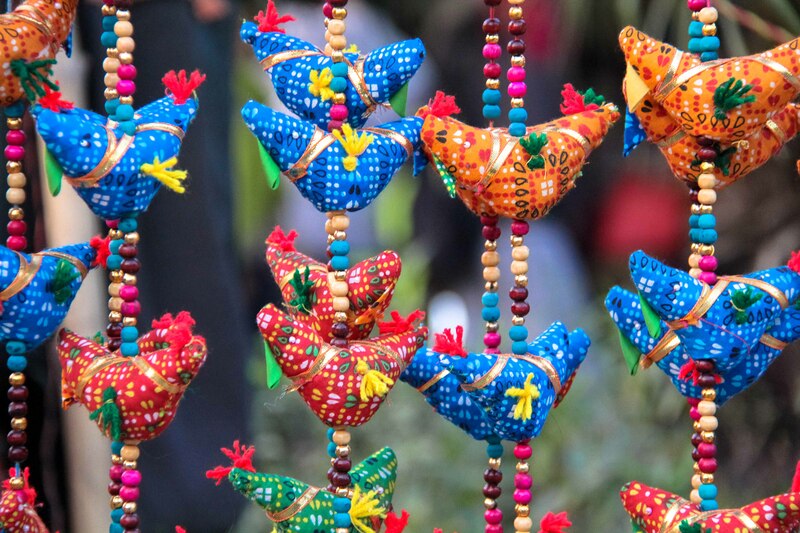 It took nine years to build and cost 1.5 million rupees at the time. Sounds extravagant, but compared to the Taj Mahal built by the Shah Jahan, the fifth emperor, it was rather modest. The entire complex of Humayun’s Tomb is quite spectacular. 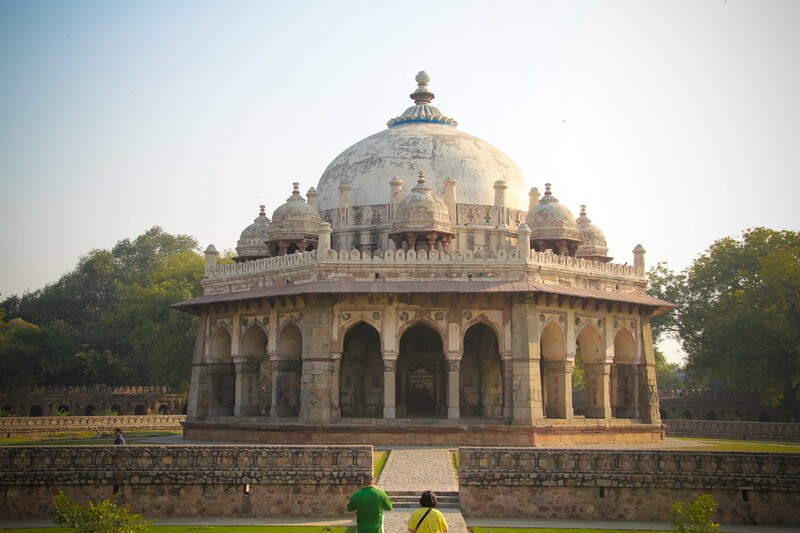 We were distracted by Iza Khan Niyazi’s octagonal tomb even before we made our way to the actual Humayun’s Tomb. 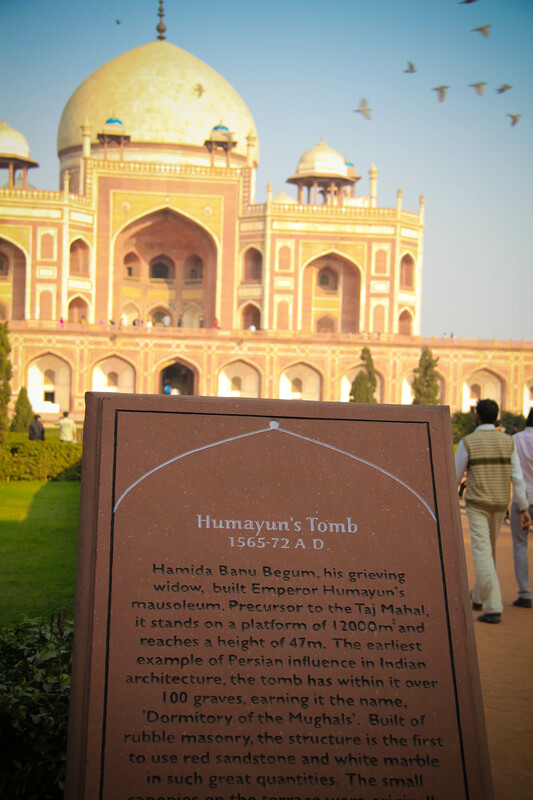 And finally here is Humayun’s Tomb. Adorned with many intricate details, this monument is primarily made out of sandstone and marble. It was declared a UNESCO World Heritage Site in 1993. That tiny little thing in the middle of that photo is me! 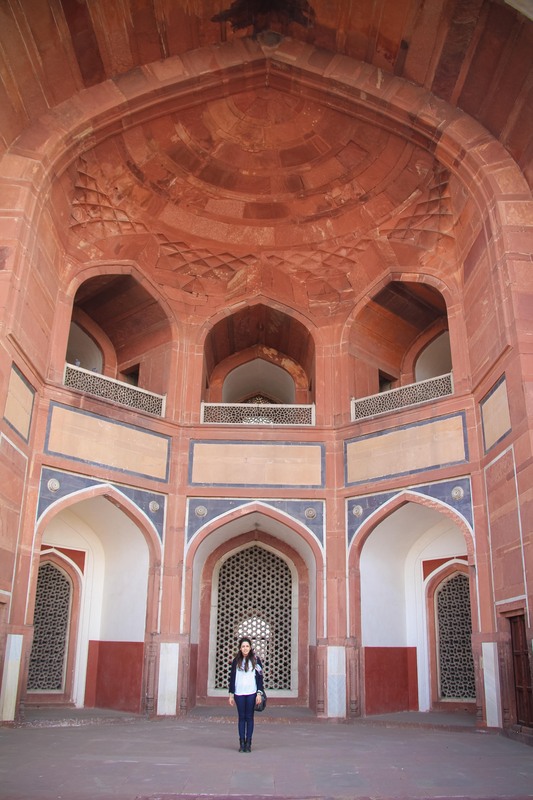 I am standing under the exterior arch of Humayun’s Tomb. The grandeur and size of this place is just amazing. 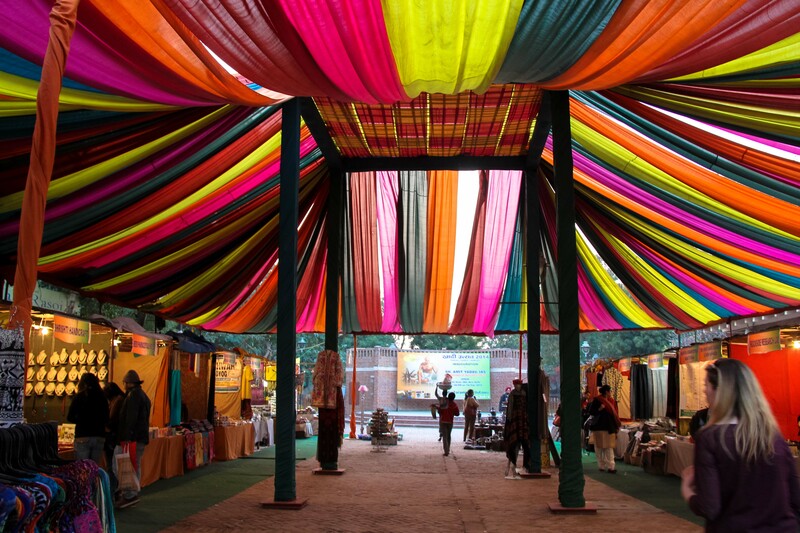 Having worked an appetite after all this sightseeing, our final stop on the Delhi Dash tour was Dilli Haat, an open-air flood plaza, arts and crafts market, and culture centre that is likely to wow tourists and locals alike. But, we were here for the food. At least I was. 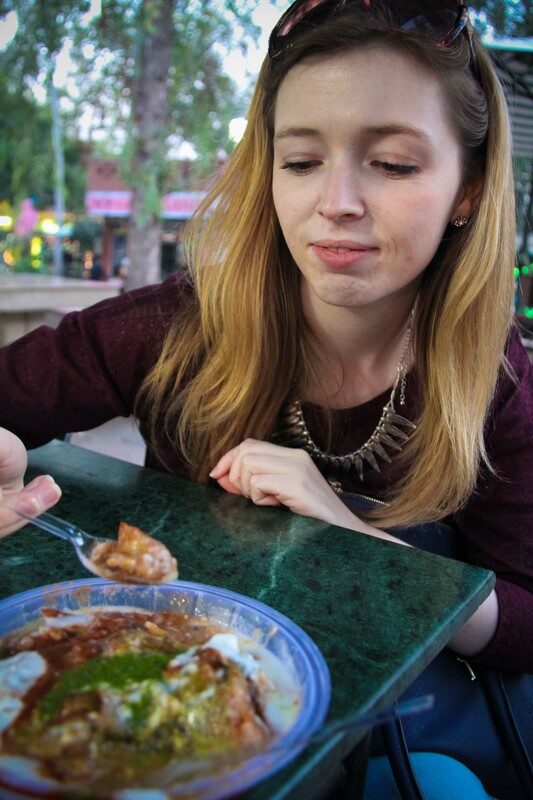 It had been less than 24 hours since Cat got off the plane, so we were being cautious and trying not to shock her system with spicy Indian food. However, I have been back for weeks! 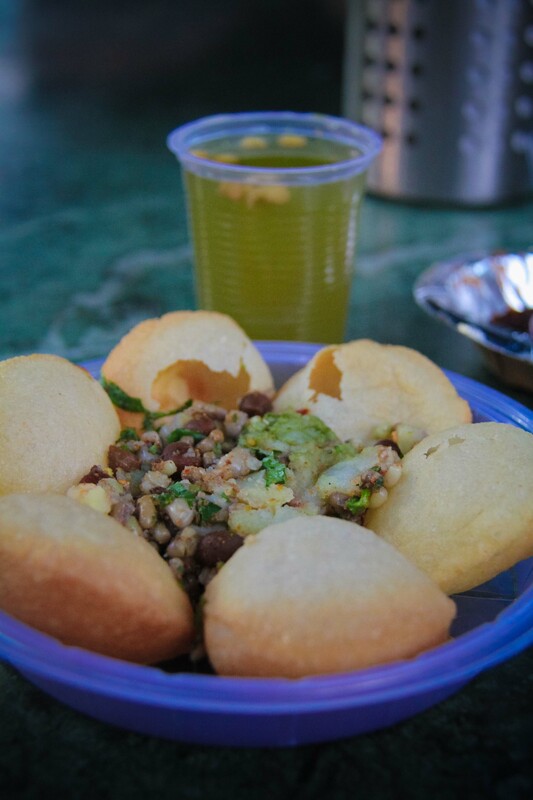 So, I ordered myself a plate of gol guppe or paani puri. And it takes some skill to eat them without making a mess. My mouth was on fire after gol guppa number two, so Cat decided to skip this one. 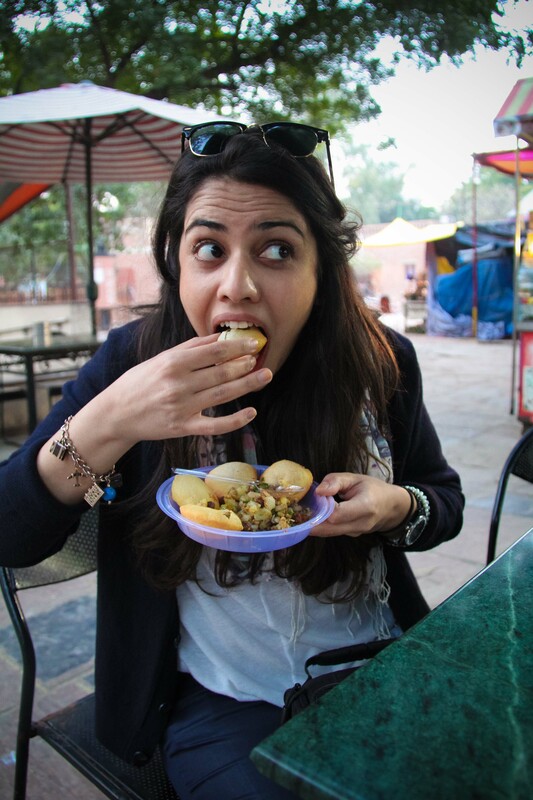 But, she did give aalo tikki (potato cutlets) a try. 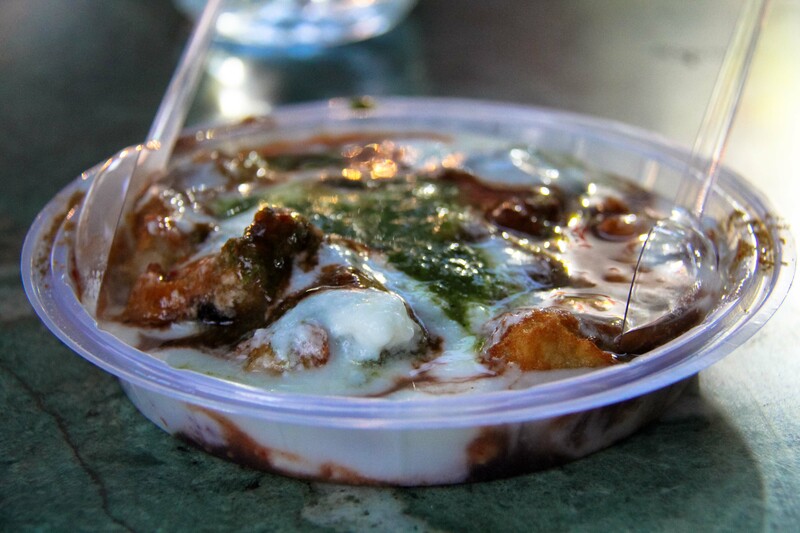 Now we know that any signs of the dreaded Delhi Belly are a result of this. But, it was delicious, gluttonous and totally worth it. 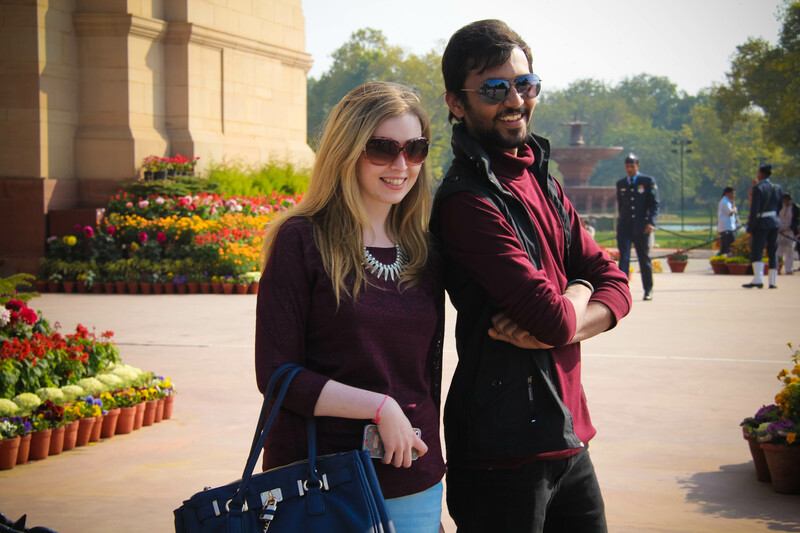 Not a bad orientation tour of Delhi, what do you think? If you would have planned a different itinerary, let me know in the comments below. I think everything was planned perfectly. I truly enjoyed reading about your adventures, your friend Cat and of course, I love the pictures.